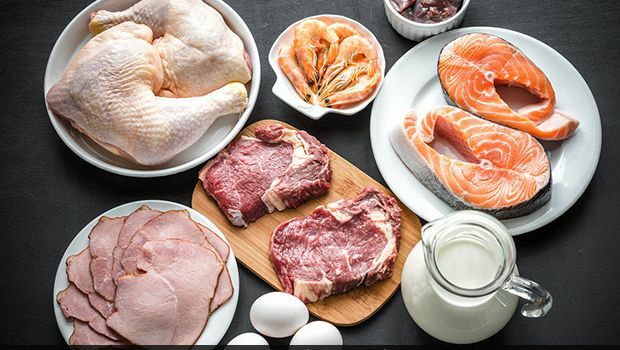 Excessive protein consumption, a Toronto registered dietitian said, could hinder you from a balanced diet and increase risk for chronic illnesses like kidney disease. You may have been eating goat roti or goat head soup your whole life, but for many, goat is still considered a “new” type of red meat. Goat meat is a staple in many cultures, including North African, Middle Eastern and Caribbean cuisines, said registered dietitian Anar Allidina. “Goat meat is a healthy alternative to beef and chicken because it contains fewer calories, fat, and cholesterol,” she told Global News. Earlier this month, in an interview with HuffPost U.S., chef Andrew Zimmern told the site most people believe goat meat is tough and somehow less desirable than pork, lamb or beef. “I’ve had superb goat curries in the Caribbean, roast baby goats with chilli vinegar and onions in Venezuela, spicy wok-tossed goat and lemongrass in Vietnam, elegant Michelin-starred plated goat rib and loin plates in Europe, goat head soup in Argentina, raw goat in Ethiopia, goat with lemons and chillis in Cyprus and goat cooked with yogurt and flatbread in the Levant,” he continued. Not only are people seemingly afraid of eating the meat, but numbers also reflect a disinterest. In the U.S., the Department of Animal Science at Cornell University found only 0.25 pounds of goat meat was consumed annually per capita last year. A report from 2013 found an interest in goat meat in Canada continued to rise (the number of goats on farms had doubled since 1996) as new immigrants came to the country, CBC reported. But Allidina said goat is still considered an acquired taste. Besides the taste, there are several reasons why you should consider eating goat, if you have access to it. Three ounces of goat meat has about 122 calories, 0.79 grams of saturated fat and 3.2 milligrams of iron. This is compared to 179 calories, three grams of saturated fat and 2.9 milligrams of iron in beef. She added because goat meat is lower in fat content and has less marbling in its meat, it is very tender and can be prepped over low heat to preserve tenderness and juiciness. The one problem you’ll find with goat meat is accessibility. Because it’s not sold in major grocery chains, you’ll have to venture out to a butcher or grocery store that sells Middle Eastern, Indian or Caribbean foods. “There are many ways to cook goat meat, all requiring slow cooking and low heat, plus moisture to tenderize the meat,” she continued. If you are looking for starter recipe ideas, consider a simple curry recipe but with goat instead of pork, beef or chicken.